Ahhhh Christmas 2010 is over! With all of it's craziness and chaos it is over. All in all it was okay. A little extra stress added in with pupster getting bit and needing to be taken to the vet, he's totally fine and well I survived it! But let's talk about presents. What makes a present a present? Is it a bow? What is your favorite present? What is the best present you gave? My friend L after a particularly bad night listened to me cry and talked to me and made me feel loved. She also gave me permission to call her 24/7 when I am having a panic attack. That is a gift! 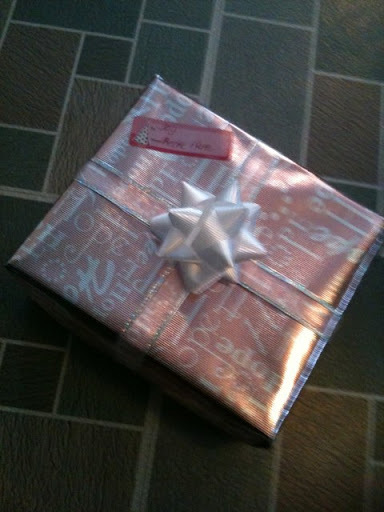 With a gorgeous bow on top - just waiting to be opened when I need a gift, cool huh? Hubster reads me poems and operation beautiful as I go to sleep at night (I am waiting on the brain cells to work again). That is a daily present, one I get to look forward to nightly. Those were my favorite presents of 2010! And my favorite to give was probably a megaphone to my nephew - he freaked (I knew he would - he drives a plow it will come in handy). My biggest surprise of a gift was a telescope I gave to a niece whom (sadly) I hardly know and her sister texted me to tell me she loved it and put it together within 5 minutes of opening it!